A couple of weeks ago I did my first watercolour painting. As a subject, I chose to repaint an old plein air oil painting of a rural shed near my home. My purpose was two-fold: firstly, to have a go at watercolour and, secondly, to fix a few of the problems in the original oil painting. 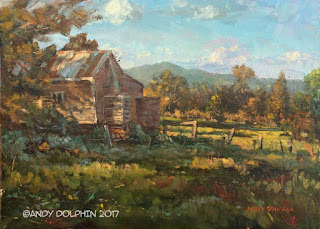 Here's the original plein air piece, which I did about 13 years ago. At the time, I was pretty happy with this painting but over the years, I've realised several issues that needed fixing. 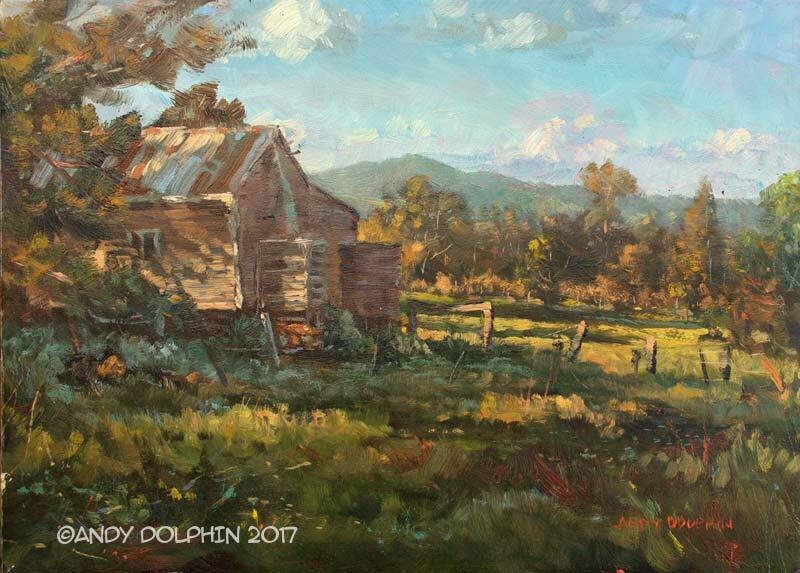 The two major issues are a lack of tonal depth – the background is almost as dark and as saturated as the foreground – and the busy brushstrokes and patterns of light and dark over-complicate the scene and reduce the visual impact. I sorted both of those problems out in the much cleaner and much simpler watercolour painting. 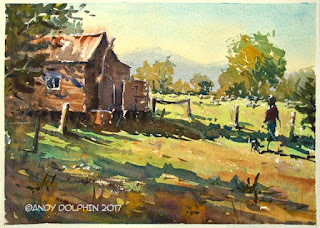 30x21cm watercolour on Arches medium. Yesterday, I decided to re-do the painting in oil, paying attention to those same problems and trying not to make the same mistakes again. While the finished oil painting is far more detailed than the watercolour painting (and took considerably longer to do), those details retain a sense of unity with their surroundings. 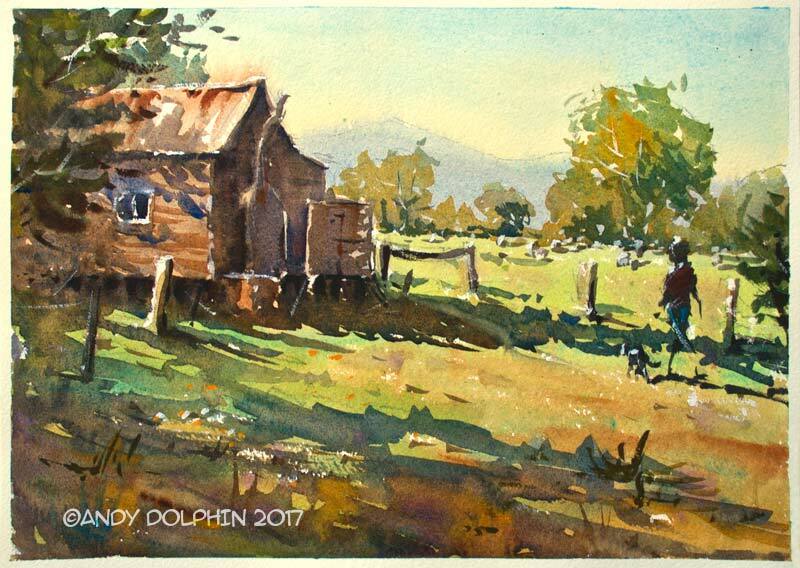 The overall contrast, especially of the shed against the background, is much improved from the original. 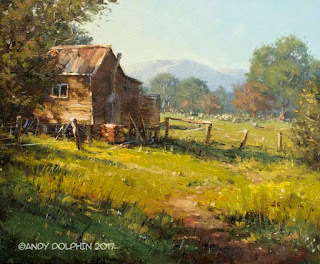 The tonal pattern of the new painting also provides much better visual impact than the original plein air work. To compare the two, try squinting at them until you only see light and dark. The new painting delivers a much stronger pattern. I also added a subtle path as a lead in and to break up the large foreground area which would otherwise be a major slab of green. The path carries some of the earthy shed colour down into the lower right corner which helps to create a colour harmony. The distant fruit trees perform a similar role. You might also note I have dropped that wooden crate from the front of the shed. In reality, the crate is no longer there and I prefer it this way, so I left it out. Although the final painting is substantially different in effect when compared to the original, it retains a genuine sense of place and I'm sure anyone who is familiar with the location would readily recognise it. Love the second oil painting. How are you finding watercolors? Have you ever thought about going loose and wild like this artist? It's not been my style, but I'd love to try. One day! The closest I ever came to going loose was this one a few years ago. However, I meant with the watercolors. To me it's a challenge, but I'd like to try.